The Walking Dead is on the move. It looks like The Walking Dead is going to be alive and kicking for many years to come. A new report claims that AMC is working on plans to expand the zombie thriller franchise with new TV movies that could turn into shows, with at least one of them taking place outside the United States. 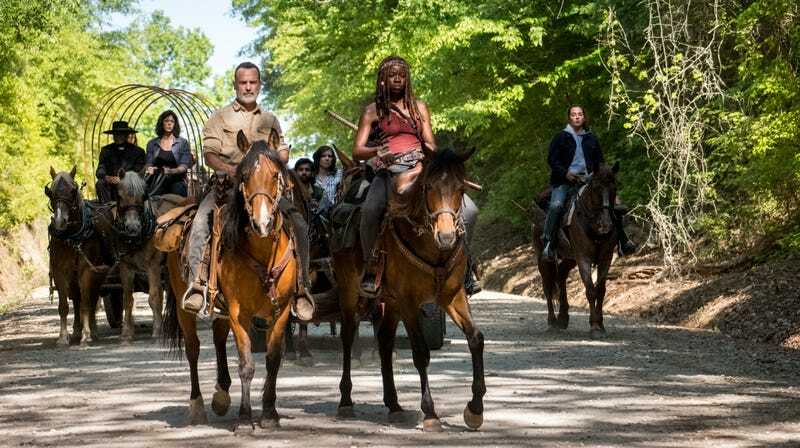 During an investor conference earlier this week (as shared on Twitter), AMC’s chief executive officer Josh Sapan said the network had plans to continue The Walking Dead franchise “over the next decade-plus,” though he didn’t offer any specifics. Some took this to mean the network wanted to keep the flagship series, which is entering its ninth season this fall, for at least another 10 years. Currently, AMC’s The Walking Dead universe contains the mainstage show, its post-episode recap series The Talking Dead, and prequel spinoff Fear the Walking Dead, which is currently wrapping up its fourth season. But AMC doesn’t look to be stopping there. According to the report, AMC wants to make a bunch of movies for either a network or streaming service that have the potential to become TV shows of their own, “setting at least one series in another country” since The Walking Dead is popular overseas. Producer Scott Gimple is reportedly overseeing development on these new storylines, but it’s not clear when or if any of them will move forward. io9 has reached out to AMC for comment and will update should we hear back. The Walking Dead returns with its ninth season, the last one to feature Andrew Lincoln as Rick Grimes, on October 7.